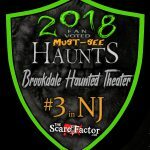 Brookdale Haunted Theater is a Haunted Attraction located in Lincroft, NJ. Team Scare Response Unit reviewed this attraction on October 15, 2017. 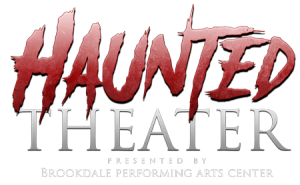 Haunted Theater is a haunted house produced by Brookdale Community College’s Performing Arts Center on the Lincroft New Jersey campus. Theater students, alumni and professionals team up to transform their entire performing arts building into a haunted house. With more then 80+ actors and volunteers this haunt was a total surprise. Celebrating their 15th year in 2017, Haunted Theater has a new theme yearly and scares around every corner. During our team’s recent visit, we were blown away with the amount of work and success this haunt has. The entire haunt (including queue line) is completely indoors and only $12 to get in for a 20 minute walk through! Our entire team was scared at least once at this haunt with their unique scares and decorated sets. If you are looking for a good time and to be scared, this is your place! Haunted Theater is made up entirely of volunteer actors. According to creators, the cast starts training at the beginning of September to prepare their actors for their characters. With cast members around every twist and turn throughout the 20 minute maze, scares consistently come at you from every angle. The pure intensity and overwhelming nature of the characters in this haunt is outstanding! All members of the Haunted Theater cast are in full appropriate costumes including shoes and makeup. Depending on where you are in the maze, the costumes match the different themes throughout. One of the most impressive parts of this haunt is their use of Special FX makeup. According to the creators, Haunted Theater has a team of four makeup artists that work tirelessly to get all the actors into the haunt on time in full makeup. Some of our favorite makeups include one of the queue line Actors Phillip (a nightmare hunter), NeMara (a witch that is casting nightmares on a village), and Margo (a plague victim). The makeup and costumes for these characters were extremely well done and the attention to detail was appreciated. After 15 years of haunted houses, Haunted Theater runs like clockwork. 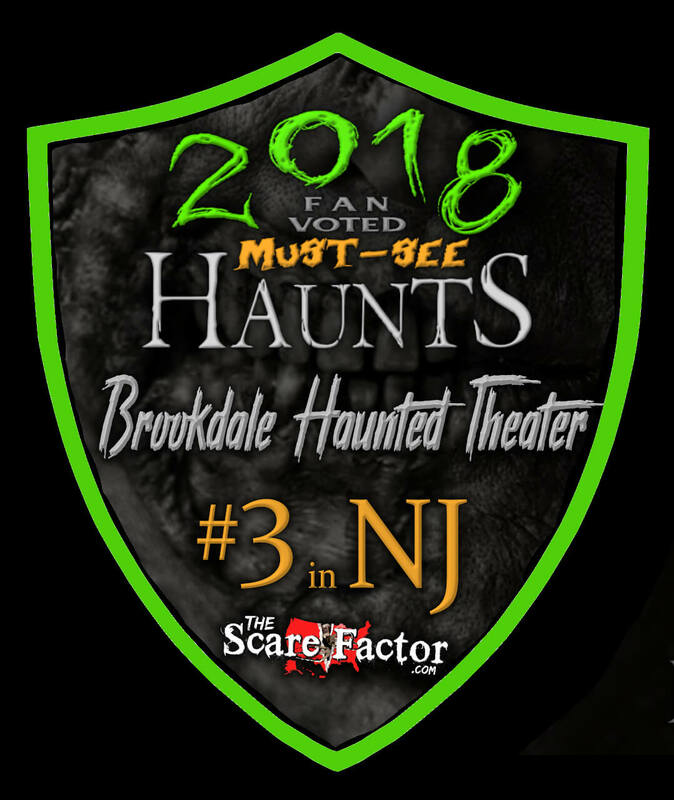 The Performing Arts Center of Brookdale College is a bit hard to navigate in nature, but the haunt has put up signs all over campus and even put a row of blow up Halloween decorations outside to lead to their haunt. Haunted Theater is an all indoor haunt with indoor seated waiting. They offer queue line entertaining in the form of actors (who are a great time) but also videos and trivia playing on a projection to keep the audience busy. Also, every 30-40 minutes the theater features a group of dancing zombies that perform two different songs onstage. The theater has restrooms available and also light concessions on property. Haunted Theater has done their best to transform the Performing Arts Building into a haunted house, but the outside still looks like a theater. Besides blow up decorations, Halloween flags, and signs it is hard to tell that it is a haunted house. There is no music playing outside or any characters. Once inside the lobby, the theater does a good job setting the tone for the haunt. Without giving too much away, Haunted Theater has really pulled out some exciting effects this year! From a post-apocalyptic bunker that is about to lose power to a full swamp laser tunnel, this haunt had us guessing what came next? Throughout the haunt lights are flashing, pneumatics are going off and fog was in the air just adding to the “WOW.” We will admit that the lighting and the special effects got some jumps out of our team collectively. Haunted Theater changes its theme yearly with this year’s theme being Never-ending Nightmares. From the moment we sat in the theater to wait, we immediately knew what the theme was. With queue line characters such as a creepy tooth fairy and a nightmare hunter, Haunted Theater uses characters to help define their theme. This year’s theme takes audience members through a myriad of different definitions of what a nightmare is including clowns, spiders, end of the world, a dentist’s office and a room filled with chewed bubblegum. This haunt got our team continuously from start to finish. With overwhelming effects and characters scaring with all sorts of different techniques, this place keeps you guessing. We seriously enjoyed ourselves at this haunt and all walked out laughing at each other. One of our favorite parts of this haunt was the continuous use of distractions and multiple scares that kept us on our toes. The value of this haunt is outrageous! For only $12 General Admission with a special price for kids under 17 ($8), you get a 20-25 minute walk through, a dance show and some queue line entertainment. This haunt is cheaper than any haunt in the area that are almost double the price. Also the haunt is entirely indoors and is open in inclement weather. For a great time and some great scares check this Haunted Theater out at an affordable price!